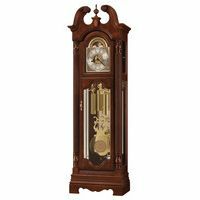 The Hermle Foreman Tubular Chime Grandfather Clock features a handcrafted solid wood case made of Walnut in Virginia USA. 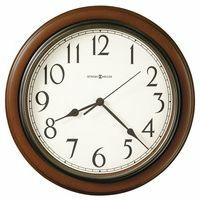 The Hermle Clock 9-tube Tubular Chimes Movement (Tubular Chimes NOT pictured in photo) and all clock accessories are made in Germany. Assembled and inspected in the USA. This cabinet is complimented by a graceful swan's neck pediment with hand-carved pediment arch, finial and center shell motif. Genuine, hand rubbed raised crotch mahogany veneer overlay panels with inlaid satinwood trim are located around the crown and base. Case has half-turned fluted columns with hand-carved column caps, separate hood an waist front waist front doors, lockable waist door with beveled front and side glass, side access doors and a three-tiered base with floor levelers. The matching set of accessories included a dial with applied brass Arabic numerals, a moving moon disk and understated cast center and corner spandrels. The pendulum bob has a matching cast center disk and the weight shells have a matching band. 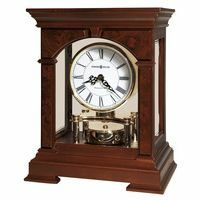 The Flagship Hermle mechanical 8 day cable driven movement with the three most renowned clock melodies, Westminster Chimes, St. Michael and Whittington, with a second hand feature and automatic night shut-off. 9 Tube Chimes.